April Fools! We may have overdone our entry into the April Fools tradition of “Fake Products You Wish Were Real” with our custom Apatosaurus figure. No, it isn’t a real release—but we hope everyone enjoyed our little prank. Head over to our Instagram post to see the behind-the-scenes of what into making this dream figure a “reality”. No hard feelings, right? What a way to start the month! 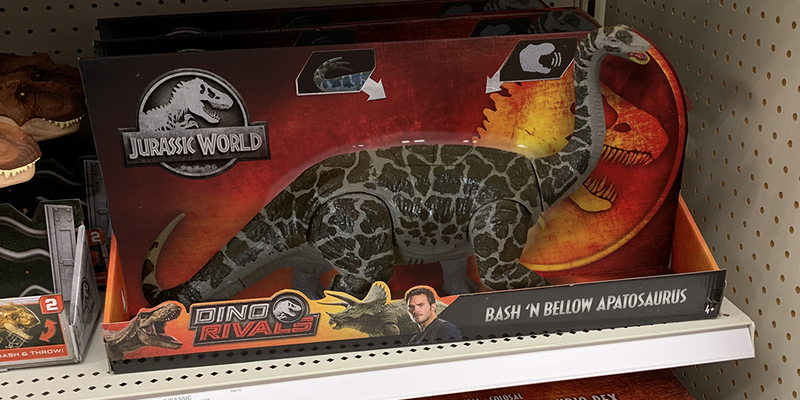 The previously unknown Bash ‘N Bellow Apatosaurus made a surprise appearance on Target shelves today, and we’re blown away by the size of Mattel’s newest Dino Rivals herbivore. We’re told Apatosaurus is larger than the Bite ‘N Fight Rex and features both a pneumatic whipping tail action and an electronic “bellow”, both activated by buttons on its back. Leg, neck and jaw articulation also appear to be present in this gorgeous rendition of Jurassic World’s long-wished for species. The toy’s suggested retail price appears to be $39.99 as indicated in the photo we received below. Be sure to follow us on Instagram, Twitter, Facebook and YouTube for more updates on this latest surprise release today. See below for a full-size image of the Bash ‘N Bellow Apatosaurus in all its oversize glory. We want to give a huge thank you to April F. for this tip! This is an awesome surprise. This wasn’t listed in any previous listing at all. 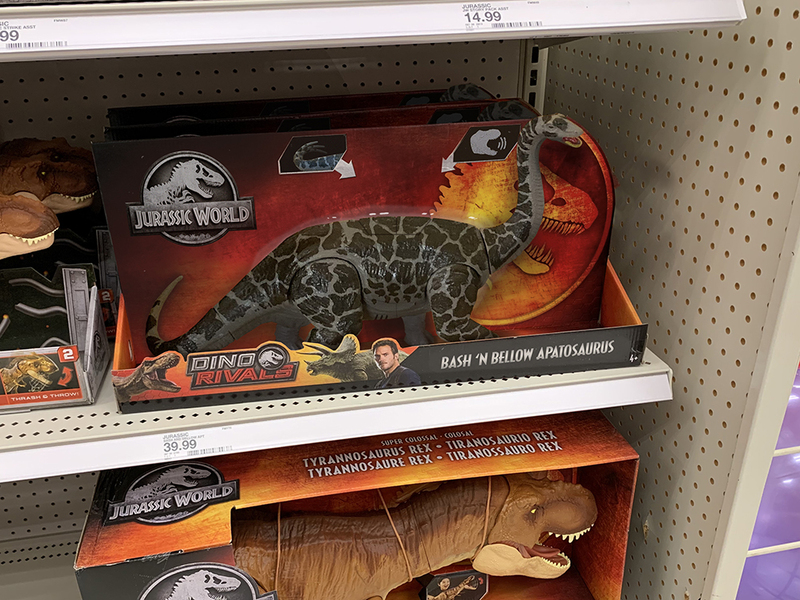 Very happy to see we have another Sauropod in this line, can’t wait to own this. Just now seeing this was an April Fool’s joke, a damn good one at that, too. That toy looks real enough for sure. Hopefully we get an actual Apatosaurus in the line eventually, between that and TLW Mamenchisaurus to keep the upcoming Brachiosaurus company. We hope so too! Who knows, maybe all the attention this silly fake image got alerted Mattel to the actual interest in this toy if it were released. I’m confused. Is this real or an April Fools joke? Hey Matt! Afraid this one will remain on our most-wanted list for now, this was our April Fools post. Hope you still enjoyed it! This just made me mad.